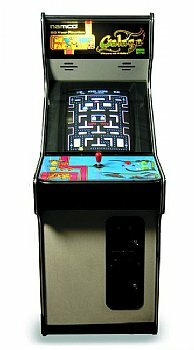 Ms Pacman Galaga arcade game rentals offers three classic arcade games from the 80's in one cabinet. Besides Ms Pacman & Galaga there is also Pacman as well. However, this is not displayed on the arcade game cabinet. Guests will have to see one of WOW Entertainment's event staff to see how to trick the Ms Pacman Galaga arcade game rental to have Pacman appear as well. The individual planning the event can contact a WOW Entertainment event specialist at 800-969-1196 or via email at info@wowincevents.com to learn how this is done. 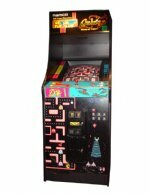 Ms Pacman Galaga arcade game rentals fit through a standard size door making it suitable choice for a variety of events and parties. However with all of our arcade game rentals if there are any stairs additional fees may apply when renting Ms Pacman Galaga Arcade Games. 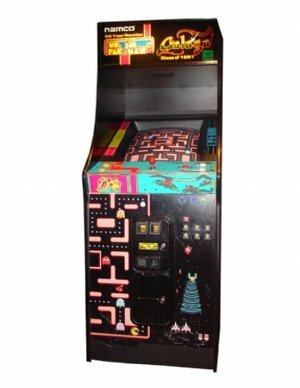 Ms. Pacman Galaga arcade game rentals offer customization opportunities for customers seeking to brand their events or galas. The marquee as well as the sides are branding opportunities. 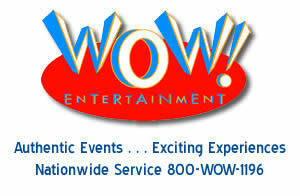 Contact a WOW Entertainment event specialist to learn more about this service at 800-969-1196 or via email at info@wowincevents.com.